This handsome ring is both elegant and masculine and looks great on any man as a chic, modern wedding band or simply a stylish everyday fashion accent. It’s made up of three interlocking 18k gold-plated bands cast in an oscillating pattern, yielding a hip, eye-catching design that rejuvenates the tired look of the classic men’s wedding band-type ring. The rim is studded with delicate rivets, adding yet another layer of distinctive flair to the unconventional overall motif. The ring’s stainless steel construction boasts a durability unmatched by more traditional ring materials – precious metals, ceramics and more. This ring is truly forged for a lifetime of vigorous wear, so you needn’t fear damage while fixing a car, performing carpentry or other hands-on work. Available in sizes 9-12, we’ve got the perfect fit for any man. 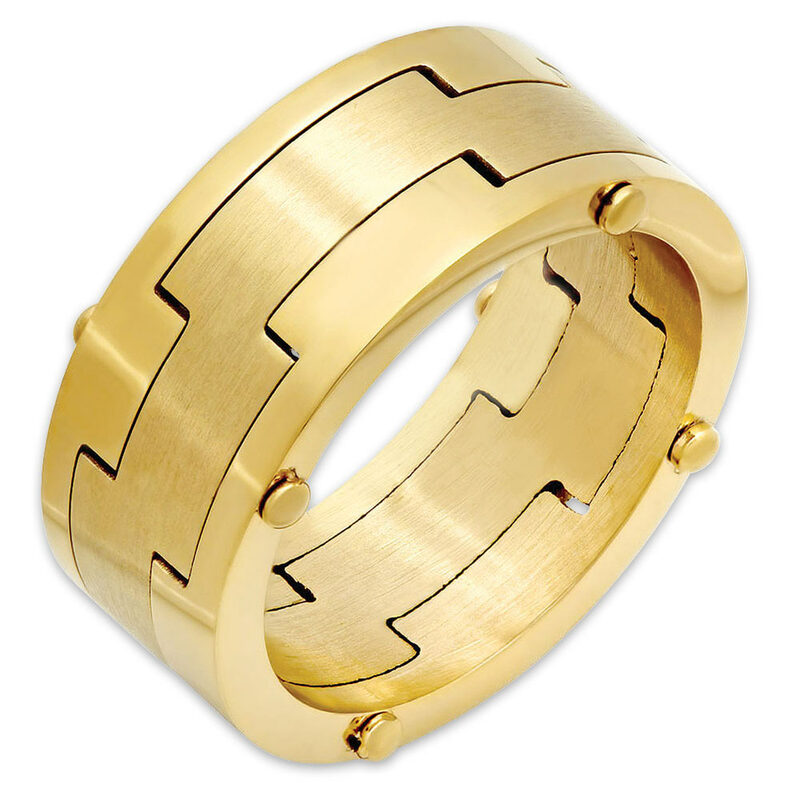 The Men’s 18k Gold-Plated Stainless Steel Ring makes a fantastic gift, and you won’t find a better price on high quality jewelry like this anywhere else.